The territorial dispute between Korea and Japan over Dokdo Islets in the East Sea, dates back to the Russo-Japanese War of 1904, explains Park Hyun-jin in his new book, “A Study of Dokdo Sovereignty,” which is by Kyungin Publishing and cost 59,000 won. Although records show that Korea obtained the original right to the Dokdo Islets during the Silla Kingdom period (57 BC-935 AD), Japan has been attempting to claim sovereignty over the Dokdo Islets after using it as a naval base during the war against Russia. Japan illegally incorporated the island into Shimane Prefecture on Japan’s west coast in 1905, even though the land was the sovereign territory of Korea, thus violating international law. Park’s book offers a comprehensive and interdisciplinary study of Korea’s sovereignty over the island, which can be asserted with “overwhelming superiority” based on concrete historical documents, geographical proximity and current international legal principles, he writes. His motivation in writing the 844-page tome was a desire to “prevent the spread of further damage to future Korean generations,” Park told The Korea Herald. “In order to maintain a firm stance against Japan’s preposterous claims, we need to compile sufficient solid evidence which includes both legal grounds and historical context,” he said. Besides illustrating how Japan’s claims to the island are groundless, the book also reflects on how poor diplomacy and misjudgment on Korea’s part resulted in the prolonged dispute. 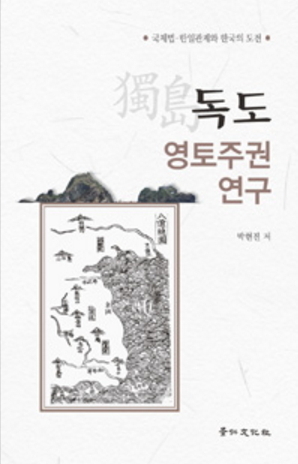 Divided into 13 chapters, “A Study of Dokdo Sovereignty” looks at historical records of Dokdo Islets ownership and relevant international treaties. It also includes Park’s suggestions on the steps the Korean government should take on the issue.